In honor of International Women's Day, Western Washington University’s Ray Wolpow Institute for the Study of Holocaust, Genocide and Crimes Against Humanity will host Anne Cubilié for “Impossibility of Witness: Justice, Gender, and Operational Practice” at 4 p.m. Thursday, March 7 in Miller Hall 152. Cubilié will discuss how ethical witnessing – listening to the voices of survivors – reformulates the language of human rights and enhances its ability to intervene against violence and oppression. Cubilié will draw from her book, “Women Witnessing Terror: Testimony and the Cultural Politics of Human Rights,” to provide nuanced examples of her work. Cubilié received her doctorate from the University of Pennsylvania and was an assistant professor of Feminist Cultural Studies at Georgetown University before spending 10 years working for the United Nations in humanitarian and developmental policy. 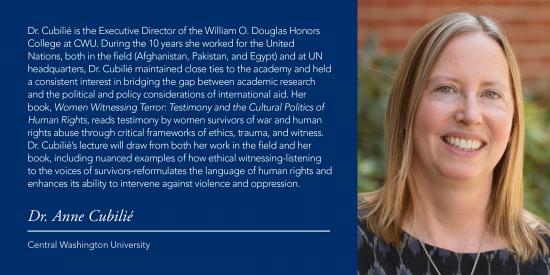 While working for the UN, her work ranged from collecting survivor testimony in Afghanistan to policy guidance for emergency response. She is now executive director of Central Washington University’s William O. Douglas Honors College. This lecture is made possible by support from the departments of Global Humanities and Religions, History, Political Science, and Modern & Classical Languages; the Fairhaven College World Issues Forum; the WWU Honors Program; Western’s Institute for Global Engagement; and Women, Gender, and Sexuality Studies. For more information contact Sheila Pennell at (360) 650-7737, wolpow.institute@wwu.edu or visit https://wp.wwu.edu/raywolpowinstitute/2018-2019-rwi-events/.